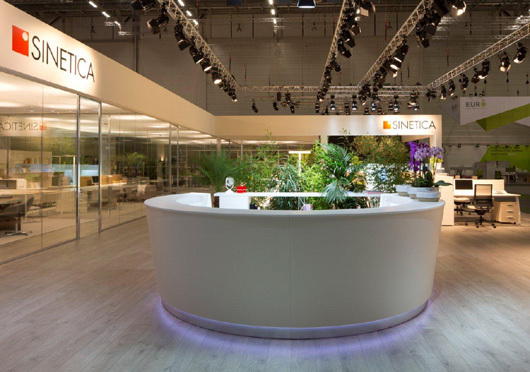 Shapes, materials, Colours and lights: they all harmoniously and naturally communicate on the stand designed by the Sinetica LAB team for the 2012 Orgatec edition. Highlight Mood reception, directional solutions Ring, Vogue and Delta, the system dividing Screen Plus, Abacus bookcase and wall system Spark Round Wall. 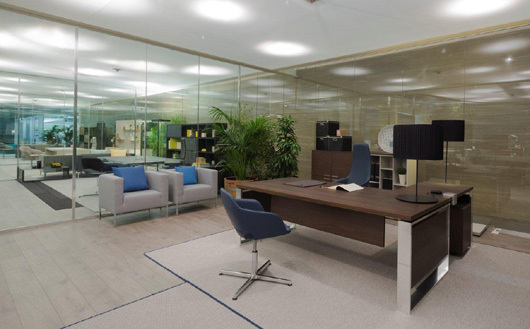 Newly “clad” furnishing elements, wool carpets, wood flooring, and plants framing the walls to create and convey a warm and cosy atmosphere of an office interior, a feeling of spontaneity that warms the environment and receives the visitors. 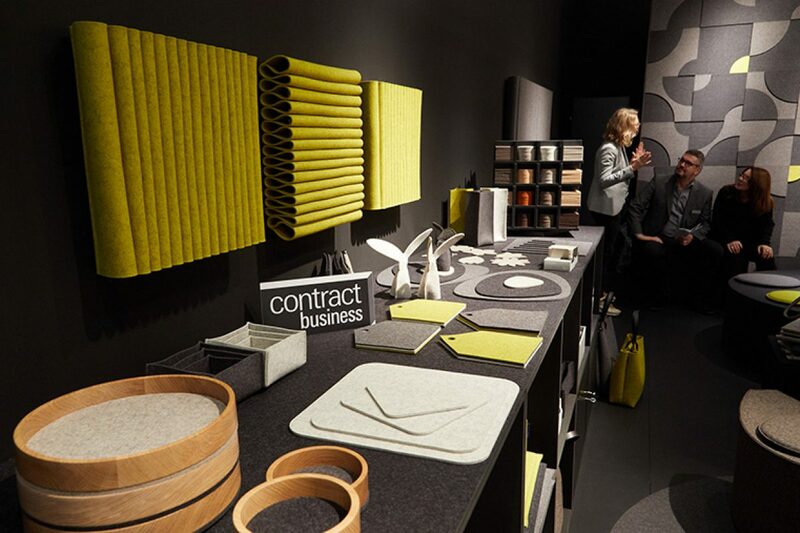 This year’s furnishing proposals complete the Sinetica “Interior Collection” range of products that was anticipated in the last edition of Orgatec. 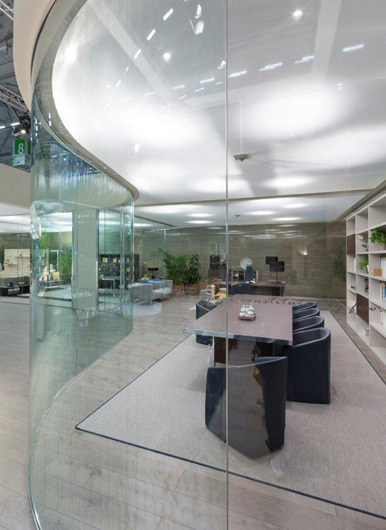 Three new directional proposals and a reception desk, new soundproof screens and the brand-new collection of partitioning walls resulting from the technological partnership with Universal Selecta. 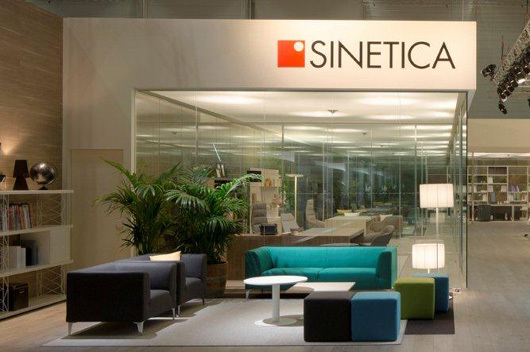 And the three melamine finishes proposed are completely new, next to the grey-wood match presented once again and the leather inserts and lacquered finishes to clothe the whole range of products in the Sinetica “Interior Collection”. Both curved and linear modules that can be matched freely to create sinuous geometries, this is the Mood reception. 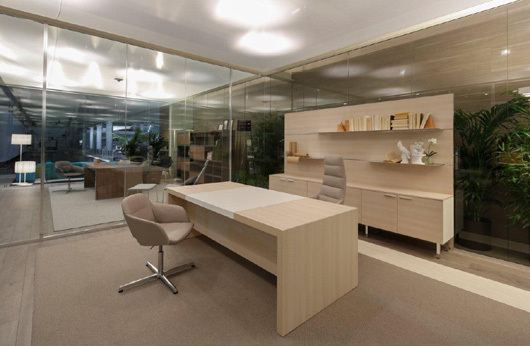 The accentuated inclination towards the middle of the front allows the public to get closer to the desk. The base is raised for inserting the LED light and the top is flush mounted. Out of all the various finishes it is proposed in lacquered matt white matched with the Wire bookcase which is also lacquered. 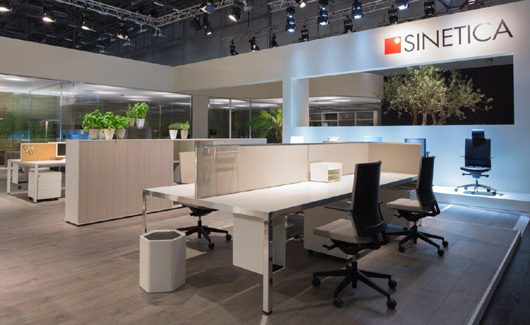 Ring is the new elegant and functional directional solution with aluminum structure closed on four sides for furnishing the direction space and annexed meeting space. 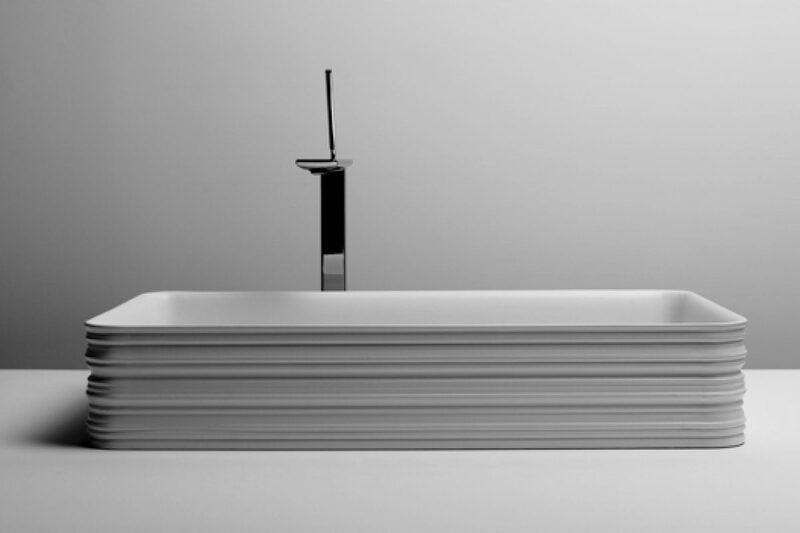 There is the choice of shelves in glass, melamine, wood and leather in different thicknesses. 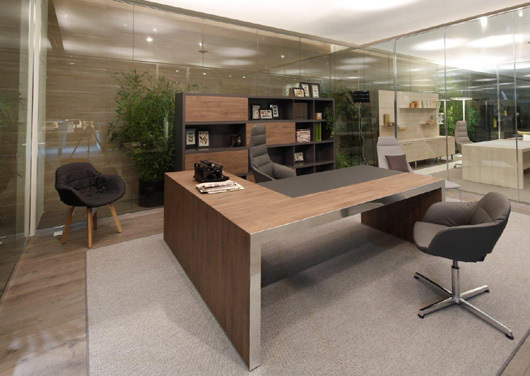 Dado Open with integrated standard lamp is matched with the directional desk while in the meeting area the Libro bookcase is proposed that marks out the rhythm of space, playing with units with and without doors. Vogue is the new directional made with an innovative T profile structure. The versatility of the claddings made in different material sandwich panels (wood, melamine and glass) is combined with the essentiality of the lines. 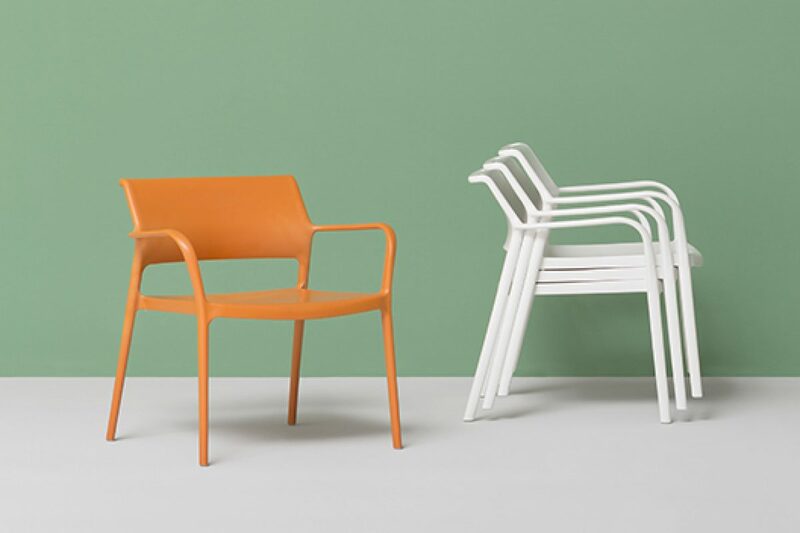 Internal wiring is possible with the frame thus upholstered which is an excellent solution as far as aesthetics and technology are concerned. Also available with an integrated typewriter table. 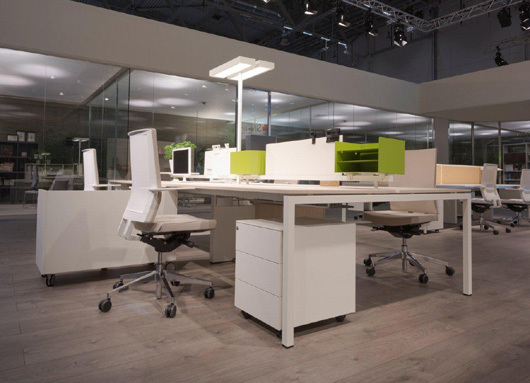 Delta, the new directional desk with thicknesses of a certain significance and minimal lines. 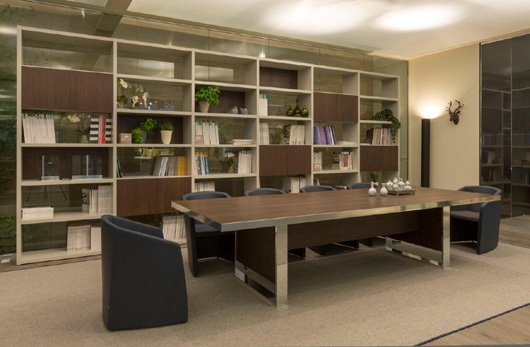 Made in 60 mm thick melamine, it is characterized by the 45° union of the desk and typewriter desk with the leg. Proposed with a leather cladding that covers the top, also available with integrated typewriter table. The main new product presented on the stand is Screen Plus, the new system for completely screening and dividing the work space. These new screens make it possible to guarantee total visual and acoustic coverage using soundproofing materials. Also available in materials on which drawing pins can be used such as cork, great for organizing everyone’s work. Accessories can be hooked on the upper accessory bar to better organize one’s work station. The new Abacus bookcase presented in this edition of Orgatec, with sliding doors that alternately show or hide the compartments that can house colored bookend boxes, furnishes and completes the space creating an environment with a living flavor. 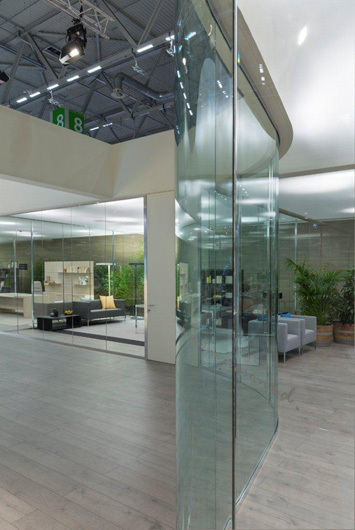 Made in technological partnership by Universal Selecta and Sinetica, is a new wall system with maximum thickness of 54 mm, with central monolithic extra thick glass panel provided with several degrees of transparency. This is an industrial product that can be used in any project fully observing safety regulations and giving maximum freedom for combinations. 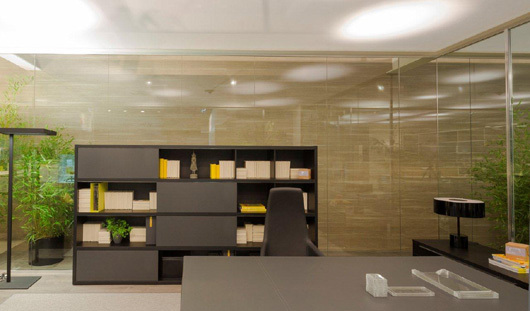 Partition walls may be monolithic glass panels aligned on a vertical load-bearing metal structure, or placed polished edge to polished edge without any uprights. For the purpose of reducing noise, panes with differentiated thickness have been coupled and used to break up the linear movement of sound waves across the structure. Glass modules can be replaced by blind panels. Inserting curved Round Wall elements makes it possible to modify layouts, going from the traditional perpendicular rigidity to gentle supple lines with a minimum radius of 900 millimetres. 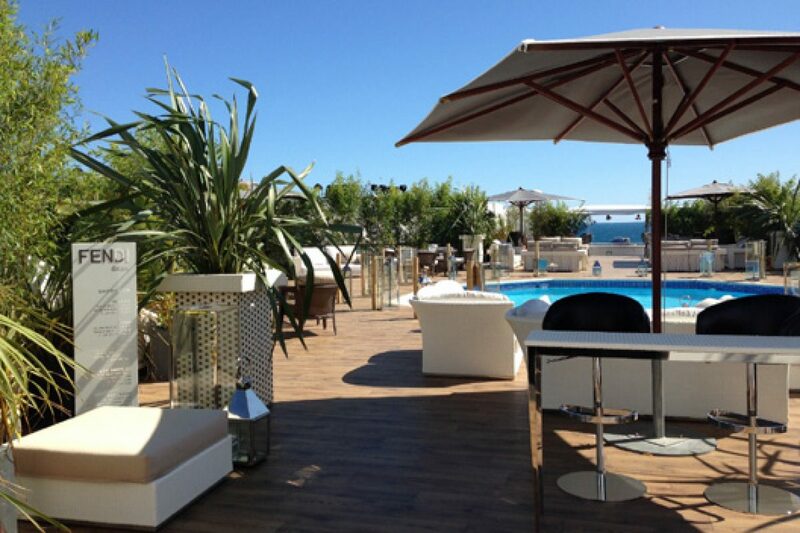 The glass is toughened or laminated and can be transparent, coloured or decorated. 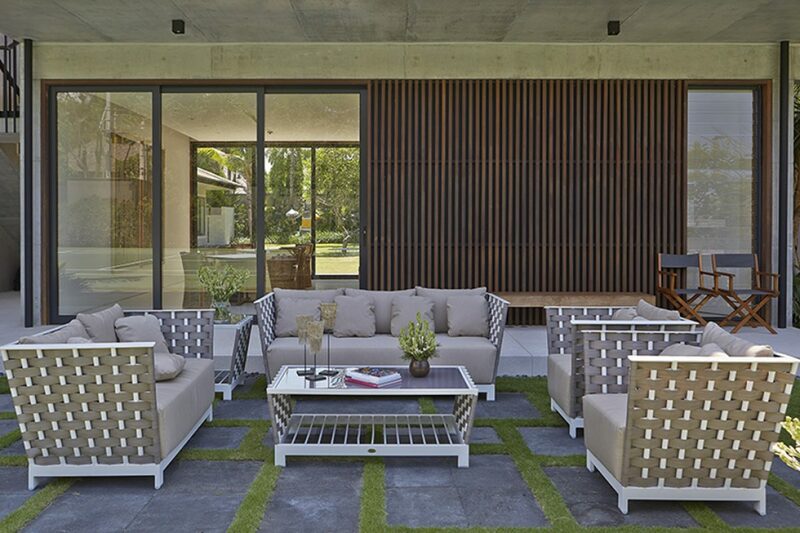 Our doors are also produced with the same radii so as not to interfere with the overall look. Spark integrates perfectly with the Between double pane system and guarantees the same certified soundproofing quality offered by our range of partition walls.